0.30 William G. Kirkwood, Revealing the Mind of the Sage: The Narrative Rhetoric of the "Chuang Tzu", Rhetoric Society Quarterly, 1992. 0.30 J.C. Mathes, A Taxonomy of Communication Acts For The Design of Advanced Writing Courses, Journal of Advanced Composition, 1980. 0.29 Helen Rothschild Ewald, The Implied Reader in Persuasive Discourse, Journal of Advanced Composition, 1988. 0.29 George E. Yoos, Rules Conventions Constraints and Rhetorical Action, Rhetoric Society Quarterly, 1979. 0.29 William G. Kirkwood, Revealing the Mind of the Sage: The Narrative Rhetoric of the "Chuang Tzu", Rhetoric Society Quarterly, 1995. 0.28 Douglas B. 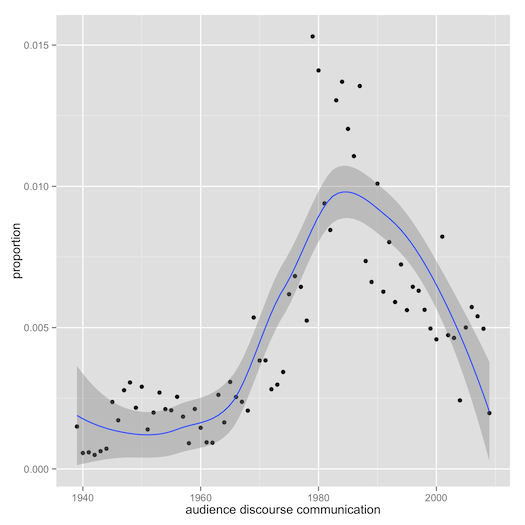 Park, Analyzing Audiences, College Composition and Communication, 1986. 0.28 Fred R. Pfister Joanne F. Petrick, A Heuristic Model for Creating a Writer's Audience, College Composition and Communication, 1980. 0.26 Lisa Ede Andrea Lunsford, Audience Addressed/Audience Invoked: The Role of Audience in Composition Theory and Pedagogy, College Composition and Communication, 1984. 0.26 Lu Ming Mao, Persuasion Cooperation and Diversity of Rhetorics, Rhetoric Society Quarterly, 1990. 0.26 Mary Jo Reiff, Rereading "Invoked" and "Addressed" Readers Through a Social Lens: Toward a Recognition of Multiple Audiences, JAC, 1996. 0.26 C. H. Knoblauch, Intentionality in the Writing Process: A Case Study, College Composition and Communication, 1980. 0.25 Glen McClish, Humanist and Empiricist Rhetorics: Some Reflections on Rhetorical Sensitivity Message Design Logics and Multiple Goal Structures, Rhetoric Society Quarterly, 1994. 0.25 Keith Grant-Davie, Rhetorical Situations and Their Constituents, Rhetoric Review, 1997. 0.25 Douglas B. Park, The Meanings of "Audience", College English, 1982. 0.25 Robert G. Roth, The Evolving Audience: Alternatives to Audience Accommodation, College Composition and Communication, 1987. 0.24 Lisa Ede, Audience: An Introduction to Research, College Composition and Communication, 1984. 0.24 Martin Steinmann_ Jr., Speech Acts and Rehtorical Action, Rhetoric Society Quarterly, 1979. 0.24 Richard Long, THE ROLE OF AUDIENCE IN CHAIM PERELMAN'S NEW RHETORIC, Journal of Advanced Composition, 1983. 0.23 Russell C. Long, Writer-Audience Relationships: Analysis or Invention?, College Composition and Communication, 1980. 0.23 Robert J. Connors, The Differences between Speech and Writing: Ethos Pathos and Logos, College Composition and Communication, 1979. 0.22 Douglas Salerno, AN INTERPERSONAL APPROACH TO WRITING NEGATIVE MESSAGES, Journal of Advanced Composition, 1985. 0.21 Winifred B. Horner, Speech-Act and Text-Act Theory: "Theme-ing" in Freshman Composition, College Composition and Communication, 1979. 0.21 Nancy Roundy Blyler, Purpose and Composition Theory: Issues in the Research, Journal of Advanced Composition, 1989. 0.21 George E. Yoos, An Identity of Roles in Writing and Reading, College Composition and Communication, 1979. 0.20 Alan Purves, Alan Purves Responds, College English, 1983. 0.20 James Wood, Function and Field Approach in Teaching Communication, Rhetoric Society Quarterly, 1979. 0.20 Gordon P. Thomas, Mutual Knowledge: A Theoretical Basis for Analyzing Audience, College English, 1986. 0.20 Paul Hunter, "That We Have Divided / In Three Our Kingdom": The Communication Triangle and A Theory of Discourse, College English, 1986. 0.20 John Chesky, A Comment on Alan Purves' Review of Dillon's Constructing Texts, College English, 1983. 0.20 Walter S. Minot, Response to Russell C Long "Writer-Audience Relationships: Analysis or Invention? ", College Composition and Communication, 1981. 0.19 Lisa S. Ede, On Audience and Composition, College Composition and Communication, 1979. 0.19 Walter H. Beale, On the Classification of Discourse Performances, Rhetoric Society Quarterly, 1977. 0.19 Greg Cowan, The Rhetorician's Personae, College Composition and Communication, 1977. 0.18 Timothy W. Crusius, Thinking (And Rethinking) Kinneavy, Rhetoric Review, 1985. 0.18 Timothy W. Crusius, A Comment on " 'That We Have Divided / In Three Our Kingdom': The Communication Triangle and a Theory of Discourse", College English, 1987. 0.18 Reed Way Dasenbrock, J L Austin and the Articulation of a New Rhetoric, College Composition and Communication, 1987. 0.18 Phillip Arrington Shirley K Rose, Prologues to What Is Possible: Introductions as Metadiscourse, College Composition and Communication, 1987. 0.17 Richard P. Fulkerson, Kinneavy on Referential and Persuasive Discourse: A Critique, College Composition and Communication, 1984. 0.17 Glen McClish, Some Less-Acknowledged Links: Rhetorical Theory Interpersonal Communication and the Tradition of the Liberal Arts, Rhetoric Society Quarterly, 1990. 0.17 James E. Kinneavy, The Basic Aims of Discourse, College Composition and Communication, 1969. 0.17 Deborah L. Asher, Response to Carol Berkenkotter "Understanding a Writer's Awareness of Audience", College Composition and Communication, 1983. 0.17 Mary B. Coney, THE IMPLIED AUTHOR IN TECHNICAL DISCOURSE, Journal of Advanced Composition, 1984. 0.16 Peter Elbow, Closing My Eyes as I Speak: An Argument for Ignoring Audience, College English, 1987. 0.16 Les Perelman, The Context of Classroom Writing, College English, 1986. 0.16 William H. Pixton, The Triangle and the Stance: Toward a Rhetoric for Novice Writers, Rhetoric Society Quarterly, 1987. 0.16 Walter E. Meyers, Literary Terms and Jakobson's Theory of Communication, College English, 1969. 0.16 Paul Bator, Aristotelian and Rogerian Rhetoric, College Composition and Communication, 1980. 0.16 John Hagaman, Using Discourse Analysis Scales to Encourage Thoughtful Revision in a Kinneavy-Framed Advanced composition Course, Journal of Advanced Composition, 1980. 0.16 Chris Madigan, Improving Writing Assignments with Communication Theory, College Composition and Communication, 1985. 0.16 Ron Coulthard, Resignation, College Composition and Communication, 1979. 0.16 Annette N. Shelby, DEVELOPING CONTENT FOR AN MBA COMMUNICATIONS CLASS, Journal of Advanced Composition, 1983. 0.15 Timothy W. Crusius, Reflections on "A Pragmatic Theory of Rhetoric", Journal of Advanced Composition, 1990. 0.15 Lynn Z. Bloom, Vanishing Species, College Composition and Communication, 1976.